Home » Useful Guide » How to Hard Burn Forced Subtitle of Blu-ray DVD Movies? When watching Blu-ray disc or DVD disc on computer or BD/DVD player, you can select different subtitles. You may sometimes get some movies in MKV or AVI formats, which are ripped or decrypted with .srt or .sub as subtitle file for choosing different languages. However, most of the devices do not support external subtitles yet, especially the on the go. For example, iPad, iPod, PSP, Xbox, Apple TV. To enjoy Blu-ray movies and DVD videos with subtitles, we shall hard burn subtitle to video, it is also called hardcode subtitle to video. Hard burn is the technology of burning the subtitle characters to the video image, so that when video plays, the subtitle will appear simultaneously without external subtitle files in .srt or .sub, or .ifo. For BD/DVD disc with foreign/alien language, there will be forced subtitles for selection. 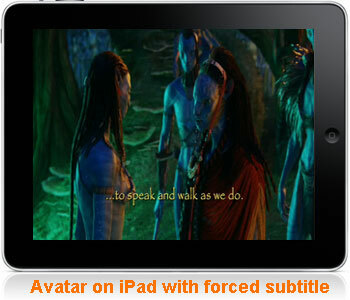 Movies like Star War, Avatar, and District 9 include forced subtitle so that you will understand what the conversions are about. Aunsoft iMedia Converter for Mac is the best solution for watching BD/DVD movies with forced subtitle on iPad, PSP, Xbox, Android phone in the market, and follow is the step-by-step guide to hardburn/hardcode forced subtitle of BD/DVD movies for iPad. Step 1. Load BD/DVD to Aunsoft iMedia Converter for Mac. Connect BD/DVD drive to iMac and insert BD/DVD disc like Star War, Avatar, and District 9 with forced subtitles. Click the BD/DVD Folder button and choose the drive with BD/DVD movie from the pop-up window. Step 2. Choose subtitle for output video. With Blu-ray disc, generally there is one option per language and the forced subtitle is included to the language option. With DVD disc, there sometimes two options per language, so that you can choose the option with forced subtitle only. Step 3. Choose MP4 output format. Just click the Format option and choose the category according to your usage. You can use MP4 with H.264 codec, as it is the most commonly-used file extension and codec compatible to different devices. The screenshot below is for iPad. Step 4. Convert BD/DVD to MP4 with forced subtitle. Click the convert button to hard-burn/hard-code forced subtitle to MP4 video. Then connect iPad or iPod with the iTunes to sync the output MP4 video with hard-burned forced subtitle, or transfer MP4 video with hard-coded subtitle to PSP, Xbox for watching anytime you want. Aunsoft iMedia Converter for Mac is a fast converter to hardburn/harcode forced subtitle of BD/DVD movies to MP4. It also supports the conversion of different formats like MKV to MP4, M2TS to MP4, MTS to AVI, etc. Hope you enjoy the universal application.